“Jewish East London and the Myths of Integration” Jewish and Muslim UK Immigration Experiences: Echoes of the Past, Influences on the Present, Cambridge Muslim College/Woolf Institute Cambridge, December 2018. The Woolf Institute and the Cambridge Muslim College are jointly organising a one-day conference on ‘Jewish and Muslim UK Immigration Experiences: Echoes of the Past, Influences on the Present’ on Thursday 6 December 2018. This conference will be looking at the similarities in experiences in immigration between the British Jewish and Muslim communities. It has become clear to several researchers in the field that the experiences of British Muslims are in some ways similar to the experiences of British Jews from a century earlier. This conference will allow researchers who wish to explore such connections an opportunity to present their ideas and research. The number of attendees is limited to 40 as the aim is to encourage an atmosphere of discussion, engagement and exchange amongst participants. The morning session and lunch will take place at the Cambridge Muslim College, 14 St Paul’s Road, Cambridge CB1 2EZ, between 9.15am – 1pm, The afternoon session will run between 2.30pm – 6pm at the Woolf Institute, Madingley Road, Cambridge CB3 0UB, followed by a reception. A brief historical exploration of the similarities and differences between Jewish and Muslim religious claims, between their political engagement with wider society, and between antisemitism and Islamophobia in the context of and recent debates surrounding multiculturalism. Tracing the experience of three families of Jewish immigrants over three generations, one family each from Germany, Poland and Egypt. How were the original immigrants received in the UK, and how did they adapt to the new culture? In the second and third generations, how did individuals acculturate, and how and why did some break with the original culture while others sought ways to return to their ‘roots’? The East End of London is an iconic site of migrant arrival and integration, and its history and present are conventionally narrated through a story of ethnic succession as each “wave” of migrants arrive, settle, integrate, move up and move out to make way for the next “wave”. In this narrative, Jews are often framed as a “model minority”, against whom other minorities are judged (and usually found wanting). This paper, based primarily on archival research on early 20th century East London), explores some of the flaws in this narrative, by emphasising different responses to integration among the Jewish migrant population, forms of inter-ethnic contact (including Jewish-Muslim contact), and other Jewish trajectories which cut against the successionist narrative. 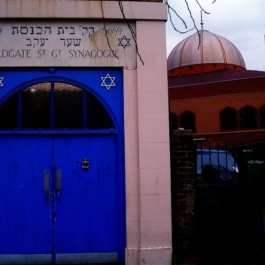 Contemporary relations between the Muslim and Jewish communities in Britain have been largely shaped and marred by international politics as a result of the creation of the state of Israel in the aftermath of the Second World War. However, historically the two distinct communities have enjoyed long periods of cultural proximity and cross-fertilisation, particularly in their migration and settlement experiences in Britain. From as early as the late-eighteenth century Maghribi and Levantine Muslim and Jewish traders migrated into the ‘Cottonopolis’ of industrial Manchester and their shared middle-eastern traditions and cultures ensured that both communities enjoyed a lengthy reciprocal relationship of inter-religious tolerance and collective community development. This paper explores some of the issues, experiences and historical details relating to Muslim and Jewish communities in 19th century Manchester. My talk will explore the ways in which Jews and Muslims have been racialized in relation to mainstream discourses within British culture. It will look at some theoretical work (especially around supersessionism) to show that both Jews and Muslims are bifurcated into “good” and “bad” versions which play off each other in the form of racialized tolerance. The talk aims to understand the mechanisms of this bifurcation and the ways in which such distinctions function culturally, socially and politically within the British nation-state and beyond. Such processes, in differing historical contexts, apply to both Jews and Muslims now and then. Registration is free an includes lunch and evening reception. Tickets must be booked in advance on Eventbrite here. For further information, contact Claire Curran at cc640@cam.ac.uk. This entry was posted on Tuesday, November 6th, 2018 at 12:02 pm	and tagged with Alyaa Ebbiary, Bryan Cheyette, Cambridge Muslim College, Ed Kessler, Humayan Ansari, Mohammed Seddon, Norman Solomon, Woolf Institute and posted in East London, Faith and secularism, Integration, Jews and Muslims, Talks and events. You can follow any responses to this entry through the RSS 2.0 feed.